As a percussionist who most often found himself inside large and complicated multi-percussion setups, I became tired of having to, in effect, learn a new instrument every time I played a new piece, constantly reinventing my technique and musical approach. Additionally, the logistical considerations of instrument setup and cartage consumed so much of my time and energy that sometimes I barely felt like a musician. I wanted to have a relationship with an instrument in the same way a violinist or clarinetist does; I wanted to be able to practice more than one piece in a given day without having to take a half hour in between to make setup changes; I wanted to not have to make so many programming sacrifices for the sake of stage setup and instrument availability. The answer was this: a specialization, not in one instrument, but in one setup. A collection of instruments that are set up and notated in the same way for every piece and for which many pieces are written. Additionally, as part of my exploration of this setup as an “instrument,” I have decided that it is necessary to include the pitches the individual instruments produce as a key characteristic of the setup. This means composers have the chance to write not just for a specific set of instruments but my specific instruments with the specific pitches they produce. This creates an opportunity for a true marriage of determinately and indeterminately pitched instruments and eliminates the reliance on novelty of sound on which so much of the percussion repertoire is based. Although future performances of these works by other performers will not necessarily use instruments with the exact pitches of my instruments, the sounds produced by those performers will not be any more indeterminate than would be in the normal case of percussion setups. I hope as the repertoire for this setup grows, performers and composers will grow with it in much the same way we develop with the repertoire of a new ensemble (like the Pierrot ensemble). So in addition to serving my own purposes, I think this project will increase the chances for the creation of a lasting repertoire which is not as reliant on the novel sounds and techniques of unusual collections of instruments, but rather is built on a new sonic, technical, compositional, and musical convention. View existing works written for the setup. Please note that this collection of instruments is intended to provide a variety of applications, and it is NOT recommended that the composer use all or even most of the instruments above. A combination of 6 or fewer instruments is advised for best results. Smaller setups will still be set up as indicated below and should be notated as such. Note the two top percussion staves have different clefs so they maintain their identity even if only one staff appears on the score page. Pitches in parentheses are secondary pitches. All pitches are somewhat approximate. Pitch of the snare drum is not apparent when the snares are on. Pitches listed for the triangle are the most prominent among many others and are in variable register. Although the approach of this project treats this Setup as one instrument, in reality it is still a collection of many different instruments. This Setup is, in fact, more like an ensemble than one solo instrument, and composers will find a more polyphonic ensemble-minded type of composition will tend to work best in conception. In practice, however, the logistical considerations involved with a solo realization of an “ensemble” style piece often make it largely unplayable. A playable version of the same ensemble idea will often be watered down, and beyond its value as a virtuosic show piece, it is in danger of not actually being an effective piece of music. The question “would this still be a good piece if there were four percussionists playing instead of one?” tends to come up often in reference to this repertoire. That isn’t to say that effective works have and will not be written in this style; however, I believe that the best solution to effectively writing for this Setup is to have a truly solo concept from the start of the composition process, or at least a healthy balance of solo and simple ensemble ideas. Because of differences in timbre, articulation, note length, etc., linear music can function effectively only in certain groups of instruments (see below). If linear writing is attempted between different groups, each group’s sounds will collect to one another in the listener’s ear and form lines of their own; if not properly cared for, these inadvertent lines can end up sounding nonsensical. If, however, one group is dominant and ONE instrument from another joins in, the new sound can function as an assistant or ornament to the primary group; but if then another instrument from the assistant group joins in, that second group will now have an identity and voice of its own and should be treated accordingly. For example, if linear music is being performed on the four drums (Group 1) and one brake drum is introduced, the brake drum will function as a highlight inside of the drum voice. If the other brake drum is then incorporated, the two brake drums will now sound as a new melodic line different from the drum voice. On the other hand, if only ONE instrument from each group is used, then, having none of their usual friends, the instruments will mix linearly with instruments from other groups (albeit in a relatively disjunct way). For example, if one brake drum, one woodblock, one tom, one cymbal, and the triangle are involved in a linear music, a disjunct but still mostly linear sounding line will result. 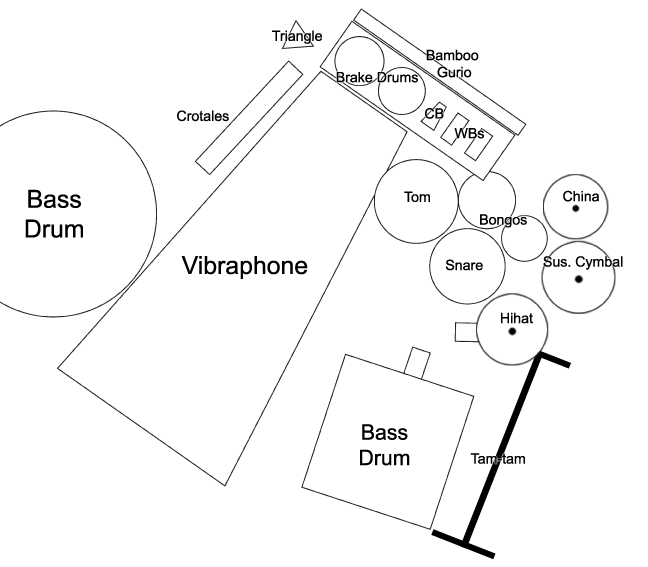 -Group 1 with kick bass drum and with concert bass drum. Kick bass works very well, both logistically and sonically; the only reason it is not in group 1 is because it faces a different direction and is struck with a different beater. Concert bass is separate because it is so much larger, and it is separated physically making linear music difficult logistically. -Group 1 with Group 2. -Vibraphone and brake drums (especially at soft dynamics, and only with one brake drum at a time). Despite the following, you can just write what you want and I’ll figure it out later. There are three pedal instruments: the vibraphone, the pedal bass drum, and the hihat. I am required to stand, so complicated work on two pedals simultaneously is difficult. If the bass drum or hihat pedal is being used, it is advisable to have the vibraphone pedal minimally active (all up, or all down, or with very infrequent articulation changes). Manipulating the bass drum and hihat pedals at the same time or in quick succession is especially difficult, particularly when the vibraphone is also being used. The hihat pedal can be disengaged so the hihat will remain closed without need of a foot. Dis- and re-engaging the pedal requires only one hand and one foot and takes very little time. Beater considerations are especially important. Beater changes often interrupt the phrase because I have to devote time and engery to non-music-making motions (reaching over to drop a beater and pick a new one up). Occasional beater changes are acceptable and often necessary, but the need for frequent beater changes should be avoided. Also, please note that using an incorrect beater for an instrument is not an effective solution, and the energy saved on beater switches will usually not outweigh the compromised sound quality. The large bass drum and tam-tam will sound considerably different when struck with the mallets appropriate for the rest of the setup than with their normal beaters, so it is advisable to allow a short opportunity to grab the larger beater before important notes; this will only take a short moment as those beaters will be positioned very close to their instrument. Drum sticks are appropriate for all instruments except vibraphone, crotales, and triangle. Sticks on guiro produces a very dark and less-appealing sound. Yarn or cord mallets are appropriate for all instruments except crotales and triangle. The shaft of such beaters can be used for the guiro, but it will produce a dark and less-appealing sound. One of these mallets, however, could be flipped over to its backside for an appropriate guiro beater. Hard yarn or cord mallets can work at loud dynamics with crotales, but only if the initial attack is masked. The clunk when the too-soft beater strikes the crotale can be hidden by a loud sharp attack from another instrument (woodblock, cowbell, etc.) leaving the appealing sound of the ringing crotale in its wake. This trick also works when hitting the triangle with drum sticks. Plastic mallets are appropriate for all instruments except the vibraphone (except at very soft dynamics). The head, shaft, and back of these mallets can work as a less-than-ideal guiro beater. Triangle beaters are appropriate for all instruments except the vibraphone and drums. These are best for the triangle and guiro and work very well for the crotales. Perhaps the most versatile set of mallets is three hard yarn mallets and one triangle beater. With the snares off, the bongos, snare drum, and tom-tom function as a set of four drums. With the snares on, it’s a set of three drums plus snare drum. It is advisable to only use the snares when absolutely necessary as they will vibrate sympathetically with all the other drums and the vibraphone. Alternatively, the sympathetically vibrating snare could be used as an effect. It takes about one and a half seconds and one free hand to noiselessly turn on or off the snares. The pitch of the snare drum is only clear when the snares are off.